Are you dreaming of Sugar Plums? Who wouldn’t have fun creating these magical wands? (1) Paint wooden stars and Paper Whimsy Alterable in desired color using craft paint. (2) Brush matte gel medium (or other adhesive) on wood stars and sprinkle Silver German glass glitter on each. This may take a few applications in order to get the star covered quite well. (3) If you are using alterables glue pieces together with desired collage image. You can also add ice resin to achieve a glass look for your piece. Place alterable on to Silver German glass wood star using E6000 glue and set aside to dry. (4) Place two different sized snowflakes together using E6000 glue making sure the snowflakes are centered and in alignment. Once the snowflakes have adhered together, add silver wooden star with collage image to center of snowflake using E6000 glue. Set aside and allow time to dry. (5) You may add dabs of silver glitter glue or stickles to the edges of each snowflake if you wish. (6) Paint a small wooden dowel rod with silver metallic craft paint top to bottom (all sides) and set aside to dry on wax paper. (7) Once dowel rod is dry, set in place on the back of the layered snowflake piece using a hot glue gun (or adhesive of your choice) making sure the dowel is pretty well covered with hot glue to hold the dowel in place. (8) Add a small amount of tinsel to the back of the snowflake. This will help hide the hot glue/dowel and give some extra sparkle. 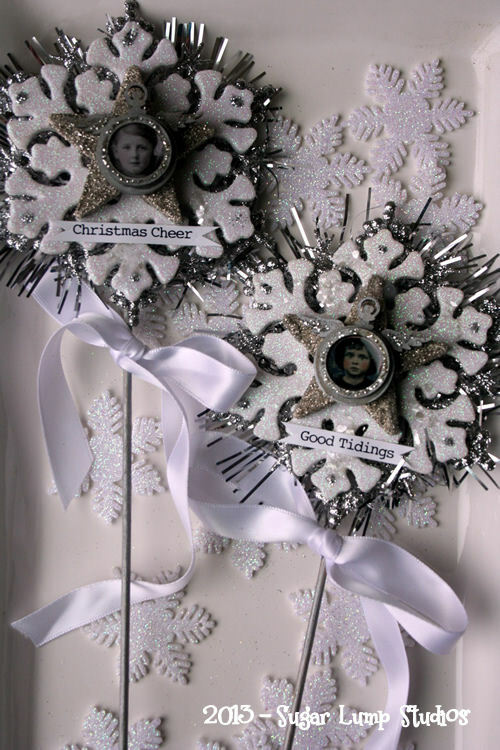 (9) Add a Christmas phrase to the bottom of each snowflake (optional) and tie a ribbon at the top of the dowel. Skip adding the dowel rod and add a hanger to use on the Christmas tree or as a package accent. Now i don’t feel so badly. These are so pretty….such a lovely idea. these are so delightful and just magical Nancy! Nancy, these are the most lovely snowflake wands! Love the sweet faces in that fabby mini winging pocket watch! Look how pretty you tied those bows. I am totally a bow challenged fool! Happy Friday! Hugs! How can it be Day 6 already?!? Please use one of your magical wands and slow things down. Another delightful design, I’ve already thought of several places to add little wands. I have a special wine bottle, someone drilled a hole in the bottom and put lights inside and I change the topper quite frequently. The sparkle here would be adorable. What fun your week of inspirations has been. THANKS SO MUCH. Your Dollar Stores are treasure troves (we have Pound shops but certainly the one we have doesn’t have such rich pickings). Always love the way you always incorporate the sweetest of faces into your creations. These are so magical! I love them! Have a wonderful weekend! Thanks again for offering such beautiful projects! you have the most wonderful ideas, -I love your faerie wands, and the magic they promise !! Winter Magic! These wands are so sweet. Thank you for yet another design full of whimsy and sparkle. These are an absolute delight, Nancy! Magic is exactly right. Sweet magic. Wonderful – now I just need to get to The Dollar Store for some of those snowflakes! Everyone needs a faere wand! Oh what fun to make sparkly wands tonight! Oh so, so lovely! I have a bunch of these in a box downstairs – now I know what to do with them!